To save a bit of time in the endless discussion / negotation of routes for club runs, I thought it might be useful if we saved routes here (along with a brief description) to help people choose from tried and trusted routes (if they want to). Feel free to add any. Unless stated otherwise, assume that they start and finish at the Town Hall on Forest Road, Walthamstow - even though most people won't actually return to the town hall if it's not on their way home - so distances are calculated on that basis. The fast group did this a few times in the summer of June 2014 and again more recently (with a detour to Fyfield by accident). A nice ride east through Lambourne End, Navestock and Stondon Massey, north up through Norton Heath, round to Matching Green and then on the return leg a succession of sprints for the Moreton village sign, the Toot Hill village sign, the Theydon Bois village sign (just over the motorway bridge) and Coppice Row hill sprint to the two '40' signs on either side of the road. About 55 miles. Did this in September 2013. Some climbing sprints in Epping Forest and through Abridge to kick off, then a more enjoyable flatter section out to Kelvedon Hatch, then back through Ongar for the sting in the tail: three more Epping Forest hill sprints. About 52 miles. 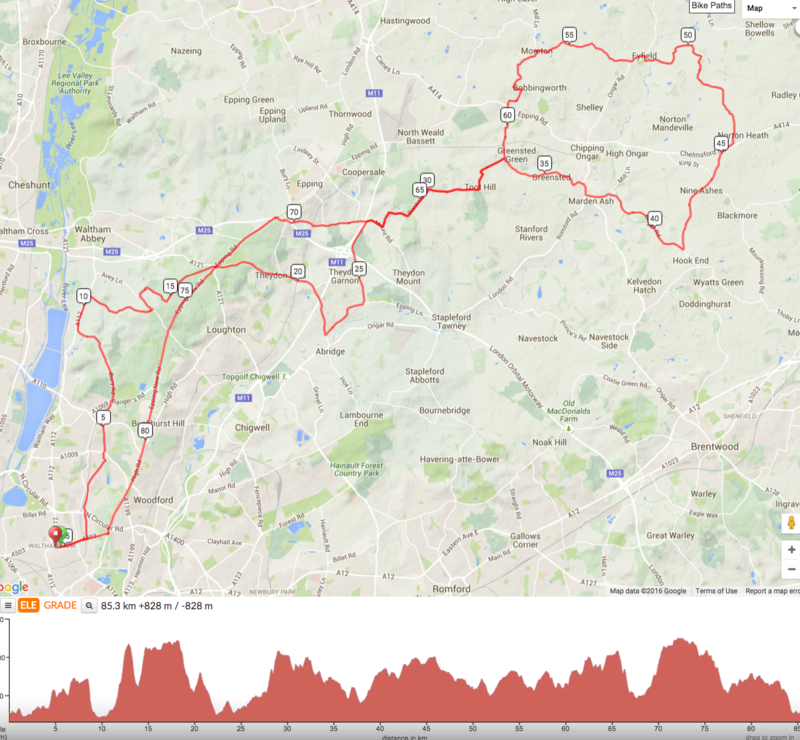 A route out and around Hanningfield Reservoir and back. Kind of did this the other week, but just retraced our steps for most of the way back after a lengthy delay for a broken wheel (!) About 64 miles. Uses the Old Harlow – Matching Green – Hatfield Heath road racing circuit. Takes the quickest route up there (straight up through Epping to the M11 roundabout), then skirts around Harlow and goes round the circuit . It takes a more meandering route back with the good old Moreton, Toot Hill, Theydon Bois and Coppice Row sprints (described above) featuring. We did this in August 2014 to help Alex prepare for a race on this circuit. About 54 miles. The 'every hill' route, first tackled in the summer of 2013, with no less than 11 hill climb sprints. One for the masochistic. Only 45 miles and never straying too far from home, but by no means an easy ride. Good shout, we'll get the downloaded now! Here's another route which I did at the end of July last summer (but I've only just got round to editing down the video). Walthamstow - Hastings in about 76 miles. Down through Stratford, Plaistow and the Royal Docks to the Woolwich Ferry (though, to be honest, it's faster to use the foot tunnel instead). For most of the rest of the route from Woolwich onwards I used the route planner on the LCC website which was brilliant - first of all in getting me out of the south-east London suburban sprawl on loads of back roads, and then getting me out onto obscure little lanes in Kent. It's all a bit ugly for the first 25 miles or so, but a few miles after leaving Dartford you get out into decent countryside. There's a lengthy bit of climbing up to a village called Fairseat and then a worryingly steep descent on the other side on Vigo Hill on the way to Trottiscliffe. Lots of villages with pubs that you could stop at - I think I had a lunchbreak at one in Yalding and another break in a pub in Seddlescombe. The mid-section of the ride is flat, but the last 25 miles are relentlessly tough - you're always climbing or descending, with a welcome plunge down Elphinstone Road at high speed into Hastings itself. I only had time for a quick look at the sea before heading to the station. I also rode out to Eastbourne around the same time. This is not the most direct route - I wanted to take in some of the best scenery in the South Downs rather than get to the town as quickly as possible (and I wanted my ride to hit 100 miles once I added on the ride home from Victoria station). Down to the Woolwich foot tunnel same route as above, then a not particularly pleasant section on the South Circular, before heading out of London via Chislehurst. My route took me on the A224 out near the M25 at somewhere called Badgers Mount, but looking at the map there's a more pleasant smaller road ('Old London Road') that runs parallel here which would be better to take. Then out into Kent and it gets hilly. Up Ide Hill and bomb down the other side. I stopped at a nice pub in Markbeech. Head down to Ashdown Forest in Sussex and then up Kidds Hill, known locally as 'The Wall'. Once you get out of The Weald you have finally have the respite of 20 flattish miles. I stopped at another pub in Laughton. Then down through Alfriston and up yet another vicious climb called 'High and Over'. Into Seaford and then turn left to head east for the rest of the ride. More climbing in the South Downs, some great views - take a breather at Birling Gap to look at the Seven Sisters chalk cliffs, stop again at the top of Beachy Head (I got fish and chips from the pub here), then finally plunge down into Eastbourne. There's no reason not to go straight to the station without following my strange detour in the town - I was just having a look at where my grandparent used to live. Thanks for adding these routes. I did the Cambridge (west ride) yesterday. Very nice route. NB that the trains take you back to Kings Cross or Finsbury Park and not to Statford, but you can get discounts for group train tickets. By the way, when I started this thread last summer it automatically inserted a map image of the routes from ridewithgps under the links. I don't know if anyone else can see them, but I can't any more, there's just a gaping void below all of my route links. Any idea what's going on there??? What about this starts with Mott and wellington and banks then out towards Norton Heath back via toot hill bumps and ivy hill. We can regroup at the top of each climb. I'm down for this, this weekend Barnaby. I noticed that RideWithGPS are now doing Club Accounts would this be a good way to manage routes for the club? I've just dropped them an email to ask for details on pricing. I'll let you know. Price for the Club Account is $250 per year (around 180 GBP at current exchange rates) . You’ll get the ability to approve multiple Club admins, and as many regular members as you would like. There’s no limit. You’ll get the enhanced route library with multiple privacy levels and the ability to Tag routes for easy organization. When the Club admins log into the Club account, they will get all of our paid features that we offer in the route planner. Events are also currently available on the Club page. Create as many Events as you want, where approved members also get paid features for. Then use them in the calendar where you can export and sync it with your own Club calendar if you would like. If you have existing Ride with GPS Club/Group routes that you will need ported over to the new account, we’ll be happy to do that for you and make the transition seamless. Let me know what questions you have or if we can help make this happen for you all. 2016 is going to be a big year for the Club account, and we look forward to the opportunity to work with you. Thanks - sounds good to me. I've sent this to upper echelons of the club for consideration. Some of us were talking last week about trying to get together a depository of various routes for rides so that whoever is choosing the club run route on any given week has easy access to a range of routes to choose from. I had a vague ghost of a memory that we had already done this before, and after some digging around I've found this neglected thread which hasn't been touched for over 3 years. Unfortunately, most (or maybe all) of the routes here would need to be updated as things have changed a bit in the last few years. It used to be that the 'fast group' (in the days before A/B/C/Social) didn't go via High Beach, but now all groups do (for the second pick up), so the routes would need go that way. For a while, some routes were being posted in this thread so there are some more to look at there, but that thread also hasn't been used for quite some time. Someone started a Lea Valley group on ridewithgps a couple of years ago or so and there are more routes there. There are also various routes which were made on Strava, which obviously won't be in the ridewithgps group, and lots of routes which were only posted to Facebook. It will take quite a while to get them all together (and to edit any which don't go via High Beach), but ultimately it should be possible to have a page on the website with lots of routes on.